As part of the Cosburn Pape Community Bicycle Day, Ward 29 Bikes and the East York Historical Society will be running a special edition of the East York History Bike Ride. Join us for a cycling tour of some of Ward 29’s historic sites. Discover the Taylors and Playters, explore the villages of Todmorden and Chester, and learn about the history of East York and area while riding with the whole family. This edition of the tour will leave our Cosburn Pape Community Bicycle Day hub at Cosburn and Pape at 1 pm on Saturday, June 18. Everyone who comes on the ride will receive a copy of the ride booklet containing information about all of the highlighted sites. The full tour will take approximately 90 minutes at a leisurely pace and is suitable for the whole family. The route is mostly on quiet neighbourhood streets or dedicated bike lanes, but there will be some short sections along main roads. The forecast for Thursday evening is clear and sunny and there won’t be a better night for our fun Ward 29 History bike ride. 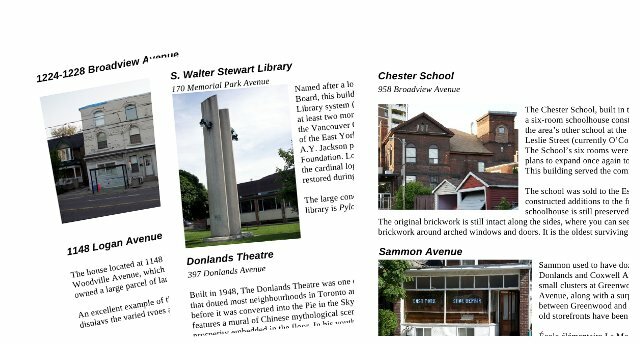 Learn about some of the families that helped to build (sometimes literally) East York, discover the hidden history in our own neighbourhood, and uncover the stories behind familiar (and not-so-familiar) buildings. The Ward 29 History bike ride is a guided tour through a selection of historic sites in three different corners of Ward 29. We ride at a comfortable pace and pause at each site for a brief discussion. For this ride only, our starting point is at Playter Gardens on Cambridge Avenue at Danforth Avenue, one block west of Broadview Avenue. Meet at 6:15 p.m. on Thursday, June 20, 2013. As always, the tour gets underway at 6:30 p.m. rain or shine, but will be cancelled if thunderstorms are likely. Email info@29bikes.ca before 5:00 p.m. on Thursday if you want confirmation of the status of the ride; final determination will be made by 5:30 p.m.
We’ve already finished half of our six scheduled Thursday Night Rides for this year. If you’ve been meaning to join us for a ride but haven’t been able to yet, this is the week to get on the bike. Join Ward 29 Bikes and the East York Historical Society for a cycling tour of some of Ward 29’s historic sites. Discover the Taylors and Playters, explore the villages of Todmorden and Chester, and learn about the history of East York and area while riding with the whole family. Meet at Playter Gardens at the corner of Danforth and Cambridge Avenues any time between 1 p.m. and 4 p.m. to pick up a route map and additional info. The full tour will take approximately 90 minutes at a leisurely pace and is suitable for the whole family. The route is mostly on quiet neighbourhood streets or dedicated bike lanes, but there will be some short sections along main roads. Watch this site or contact us for more information. We’re also looking for additional volunteers to help before and on June 11. If you’re interested in helping, please contact us or send email to info@29bikes.ca.